"Earthworm castings are the best imaginable potting soil for greenhouses or houseplants, as well as gardening and farming. It will not burn even the most delicate plants and all nutrients are water-soluble, making it an immediate plant food. Earthworm castings, in addition to their use as a potting soil, can be used as a planting soil for trees, vegetables, shrubs, and flowers..."
-- R.E. Gaddie and D.E. Douglas, Earthworms For Ecology and Profit, Vol. I "Scientific Earthworm Farming," 1975, p. 175. Vermicomposting is the process by which earthworms are used to convert organic materials into a humus-like material known as vermicast, vermicompost or earthworm compost. The goal is to process the organic material as quickly and efficiently as possible. Humus is a complicated material formed during the breakdown of organic matter by the earthworm. One of its components, humic acid, provides many binding sites for plant nutrients, such as calcium, iron, potassium, sulfur and phosphorus. These nutrients are stored in the humic acid molecule in a form readily available to plants, and are released when the plants require them. 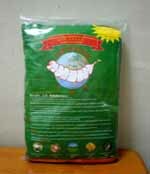 Enhance and amend soil conditions in an organic and natural way for vigorous plant grows. All essential nutrients and trace-elements are in the most simple forms, hence plants can quickly and easily absorb it. 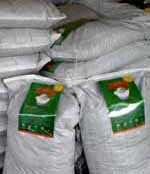 Improve soil structure to optimum conditions for maximum aeration and water retention. Balance up soil's pH reading. Improve soil's Electrical Conductivity (EC). 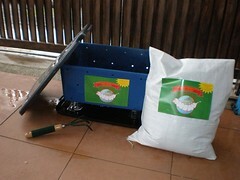 Improve the quality of the plant's yield. Improve plants' immunity system to against diseases.